Credit: Rommie Amaro, Jacob Durrant, Adam Gardner, and colleagues. Ah, December—a month suffused with light-filled holidays, presents, parties . . . and the spread of colds and flu. This playful image uses a festive approach to the serious science of understanding and finding ways to combat the flu virus. Credit: Trevor Bedford and Richard Neher, nextstrain.org. Over the past decade, scientists and clinicians have eagerly deposited their burgeoning biomedical data into publicly accessible databases. However, a lack of computational tools for sharing and synthesizing the data has prevented this wealth of information from being fully utilized. In an attempt to unleash the power of open-access data, the National Institutes of Health, in collaboration with the Howard Hughes Medical Institute and Britain’s Wellcome Trust, launched the Open Science Prize . Last week, after a multi-stage public voting process, the inaugural award was announced. The winner of the grand prize—and $230,000—is a prototype computational tool called nextstrain that tracks the spread of emerging viruses such as Ebola and Zika. This tool could be especially valuable in revealing the transmission patterns and geographic spread of new outbreaks before vaccines are available, such as during the 2013-2016 Ebola epidemic and the current Zika epidemic. An international team of scientists—led by NIGMS grantee Trevor Bedford of the Fred Hutchinson Cancer Research Center, Seattle, and Richard Neher of Biozentrum at the University of Basel, Switzerland—developed nextstrain as an open-access system capable of sharing and analyzing viral genomes. The system mines viral genome sequence data that researchers have made publicly available online. 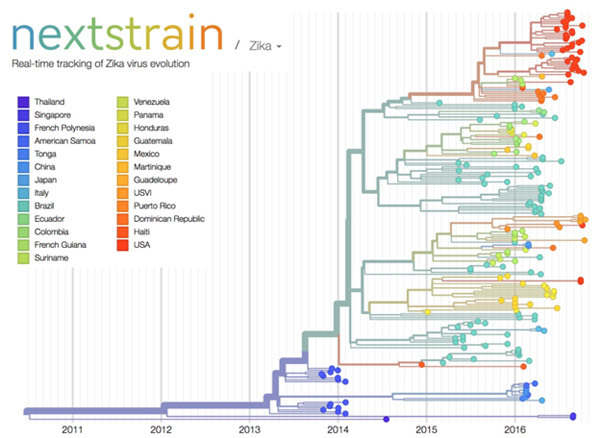 nextstrain then rapidly determines the evolutionary relationships among all the viruses in its database and displays the results of its analyses on an interactive public website. The image here shows nextstrain’s analysis of the genomes from Zika virus obtained in 25 countries over the past few years. Plotting the relatedness of these viral strains on a timeline provides investigators a sense of how the virus has spread and evolved, and which strains are genetically similar. Researchers can upload genome sequences of newly discovered viral strains—in this case Zika—and find out in short order how their new strain relates to previously discovered strains, which could potentially impact treatment decisions. Nearly 100 interdisciplinary teams comprising 450 innovators from 45 nations competed for the Open Science Prize. More than 3,500 people from six continents voted online for the winner. Other finalists for the prize focused on brain maps , gene discovery , air-quality monitoring , neuroimaging and drug discovery . nextstrain was funded in part by NIH under grant U54GM111274. Incidence of dengue fever across Southeast Asia, 1993-2010. Note increasing incidence (red) starting about June 1997, which corresponds to a period of higher temperatures driven by a strong El Niño season. At the end of the El Niño event, in January 1999, dengue incidence is much lower (green). Credit: Wilbert van Panhuis, University of Pittsburgh. Weather forecasters are already warning about an intense El Niño season that’s expected to alter precipitation levels and temperatures worldwide. El Niño seasons, characterized by warmer Pacific Ocean water along the equator, may impact the spread of some infectious diseases transmitted by mosquitoes. In a study published last month in the Proceedings of the National Academy of Sciences, researchers reported a link between intense dengue fever epidemics in Southeast Asia and the high temperatures that a previous El Niño weather event brought to that region. To help the public better understand how measles can spread, a team of infectious disease computer modelers at the University of Pittsburgh has launched a free, mobile-friendly tool that lets users simulate measles outbreaks in cities across the country. 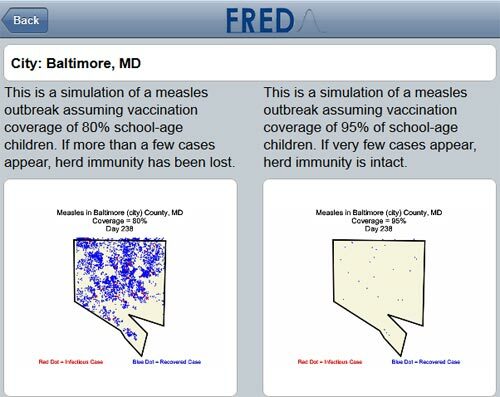 The tool is part of the Pitt team’s Framework for Reconstructing Epidemiological Dynamics, or FRED, that it previously developed to simulate flu epidemics. FRED is based on anonymized U.S. census data that captures demographic and geographic distributions of different communities. It also incorporates details about the simulated disease, such as how contagious it is. A free, mobile-friendly tool lets users simulate potential measles outbreaks in cities across the country. Credit: University of Pittsburgh Graduate School of Public Health. Just as you might turn to Twitter or Facebook for a pulse on what’s happening around you, researchers involved in an infectious disease computational modeling project are turning to anonymized social media and other publicly available Web data to improve their ability to forecast emerging outbreaks and develop tools that can help health officials as they respond. Incorporating real-time, anonymized data from Wikipedia and other novel sources of information is aiding efforts to forecast and respond to emerging outbreaks. Credit: Stock image. 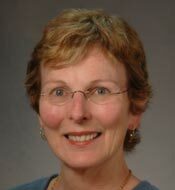 NIGMS’ Irene Eckstrand answers questions about modeling Ebola. Credit: National Institute of General Medical Sciences. 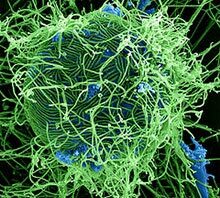 Ebola is the focus of many NIH-supported research efforts, from analyzing the genetics of virus samples to evaluating the safety and effectiveness of treatments and vaccines. Researchers involved in our Models of Infectious Disease Agent Study, or MIDAS, have been using computational methods to forecast the potential course of the outbreak and the impact of various intervention strategies. Wondering how their work is going, I recently asked our modeling expert Irene Eckstrand a few questions. How useful are the forecasts? Forecasts give us a range of possible outcomes. In addition to being a useful public health tool to prepare for an outbreak, they’re an important research tool to test assumptions about how a disease may spread. When we compare the predicted and actual outcomes, we can confirm assumptions, such as the groups of individuals who are more likely to spread the infection to others. Continually doing this helps refine the models and ensure that their forecasts are as accurate as possible. What are some of the challenges the modelers face? Ebola virus particles (green) attached to and budding from a cell (blue). Credit: National Institute of Allergy and Infectious Diseases. We need data to build and test models. The data available from this outbreak have been more limited than in most previous outbreaks of Ebola simply because the public health systems are overwhelmed with sick people, and recording information is a secondary priority. Another issue with forecasting future trends is incorporating information about the deployment of resources and the implementation of interventions that actually slowed the outbreak. We also need to incorporate changes in people’s behavior. If people think an outbreak is leveling off, they may relax the precautions they’ve been taking—and that could lead to another spike in the disease. What other Ebola-related projects are the MIDAS modelers working on? Modeling logistical factors such as the number and placement of treatment beds and staffing needs. Tracking potential transmission within and between communities and at hospitals and funerals. Developing a method to estimate the amount of underreporting of case data. Applying models of “tipping points” to look for evidence that the disease curve is slowing. Estimating the number of people who are infected but not symptomatic. Creating new resources for Ebola modelers, including standards for using infectious disease data. Calculating the risk of importation of cases for a wide variety of countries based on travel networks. How are the modelers working together? The MIDAS modelers conference call 1-2 times a week to discuss results, modeling strategies, data sources and questions amenable to modeling. They also participate in discussions with government and other academic groups, so there’s a sizable number of modelers working on a wide variety of public health, logistical and basic research questions. If you’re interested in learning more about Ebola, Irene recommends a video overview of the 2014 outbreak from Penn State University and a slide presentation on the myths and realities of the disease from Nigeria’s Kaduna State University . Works at: Columbia University’s Mailman School of Public Health, N.Y.
First job: Guide at the Franklin Institute in Philadelphia, Pa.
After 4 years of training to become an opera singer, Shaman realized that the work wouldn’t offer him career stability. He started thinking about his other interests. After college, where he majored in biology with a focus on ecology, he had volunteered to help with HIV clinical trials and developed a fascination with understanding infectious diseases. He wondered if the quantitative tools and methods used to study the physical sciences—another interest area—could inform how contagions spread and possibly even lead to systems for monitoring or predicting their transmission. So Shaman returned to school—this time, for advanced degrees in earth and environmental sciences. He now studies the relationship between soil wetness and mosquito-borne diseases such as malaria in Africa and West Nile in Florida. “I love science—probing questions, thinking about problems, finding solutions, pursuing my ideas,” says Shaman. A few years ago, Shaman took some of his scientific compositions in another direction by focusing on seasonal flu outbreaks. For more than 60 years, researchers have linked seasonal flu outbreaks with environmental data like humidity and temperature. Shaman analyzed this work and figured out that absolute humidity, rather than relative humidity, was the best predictor of outbreaks. Now he’s applied state-of-the-art mathematical modeling and real-time observational estimates of influenza incidence to predict when outbreaks will likely occur. His forecasting technique mimics that used by meteorologists to predict weather conditions like temperatures, precipitation and even hurricane landfall. Shaman’s version incorporates variables like how transmissible a virus is, the number of days people are contagious and sick, and how much humidity is in the air. The flu forecasts build on a series of studies in which Shaman and his colleagues used data from previous influenza seasons to test their predictions and improve reliability of their model. 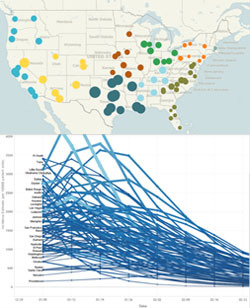 The work culminated with real-time predictions for 108 cities during the 2012-2013 influenza season. The forecasts could reliably estimate the peaks of flu outbreaks up to 9 weeks before they occurred. 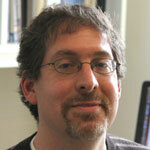 For the 2013-2014 flu season, the researchers continued to make weekly predictions. But instead of first publishing the results in a scientific journal, they posted them on a newly launched influenza forecasts Web site where the public could view the projections. “People understand the limitations and capabilities of weather forecasts,” says Shaman. “Our hope is that people will develop a similar familiarity with the flu forecasts and use that information to make sensible decisions.” For instance, the prediction of high influenza activity may motivate them to get vaccinated and practice other flu-prevention measures. As he waits for the start of the next flu season, Shaman continues to tweak his forecast system to improve its reliability. He’s also beginning to address other questions, such as how to predict multiple outbreaks of different influenza strains and how to predict the spread of other respiratory illnesses. Incidence of influenza during the week starting 12/29/2013 (top); influenza incidence forecasts for selected cities (bottom). Credit: Columbia Prediction of Infectious Diseases . News articles this weekend reported an uptick in flu cases in many parts of the country. When will your area be hardest hit? Infectious disease experts at Columbia University have launched an influenza forecast Web site that gives weekly predictions for rates of flu infection in 94 U.S. cities. The predictions indicate the number of cases in Chicago; Atlanta; Washington, D.C.; and Los Angeles will peak this week, with New York City, Boston, Miami and Providence peaking in following weeks. The forecasts are updated every Friday afternoon, so check back then for any changes. The forecasting approach, which adapts techniques used in modern weather prediction, relies on real-time observational data of people with influenza-like illness, including those who actually tested positive for flu. The researchers have spent the last couple of years developing the forecasting system and testing it—first retrospectively predicting flu cases from 2003-2008 in New York City and then in real time during the 2012-2013 influenza season in 108 cities. “People have become acclimated to understanding the capabilities and limitations of weather forecasts,” said Jeffrey Shaman , who’s led the flu forecasting project. “Making our forecasts available on the Web site will help people develop a similar familiarity and comfort.” Shaman and his team are hoping that, just as rainy forecasts prompt more people to carry umbrellas, an outlook for high influenza activity may motivate them to get vaccinated and practice other flu-prevention measures. This work also was funded by NIH’s National Institute of Environmental Health Sciences.